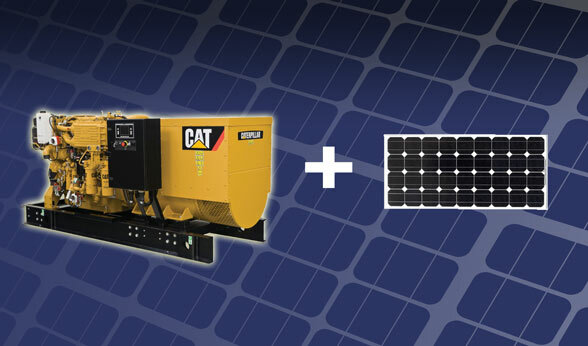 ...Caterpillar & Agriculture Solar Hybrid Generators Increases Efficiency, Lowers Cost of Gas and Maintenance. Caterpillar and Agriculture Solar hybrid generator sets for industrial or commercial applications. The hybrid controller features the reliability and durability you have come to expect from your Caterpillar equipment. This system is a scalable control platform designed to ensure reliable generator set operation, providing extensive information about power output and engine operation. Our systems can be further customized to meet your needs through programming and expansion. From 6 to 14,040 ekW (7.5 to 17,550 kVA) of power potential, our diesel-fueled hybrid generator sets are built to world-class standards, for high efficiency, low fuel consumption and global emissions compliance. Caterpillar Generators and Agriculture Solar's gensets come in a range of options to match your power needs, making selecting and installing simple. Discover power designed for your demands.